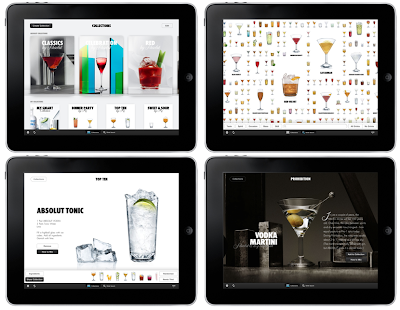 About a year ago I wrote about Absolut's iPhone 'Drinkspiration' app. There was a huge amount of interest and I thought that you’d be interested to know that there is now a 'Drinkspiration Home Edition' app available exclusively for the iPad. Where the mobile Drinkspiration was the perfect going-out bar companion, the iPad Drinkspiration app is the ideal at-home entertaining tool. With more than 3,000 drink recipes and images, six pre-installed drink collections, drink suggestions based on ingredients, a shopping list creator, social media sharing, and even 'how to' videos the home edition app is a totally inspirational resource for all party hosts and bartenders. Fredrick Tallroth, Senior Manager Interactive Marketing, at The Absolut Company, said: "At ABSOLUT, we continuously want to make the most out of new technology, and learning to mix drinks has never been this fun. With its large high-resolution display, and multi-touch functionality, the iPad is the perfect platform for making drink mixing a social happening at the party." Check out the app's promo video below and go here to download the app.